The Long-billed Vulture (LBV) has been a threatened species especially following the use of the drug Diclofenac (source Wiki) by cattle farmers. Recently these species were flagged under the “critically endangered” category. 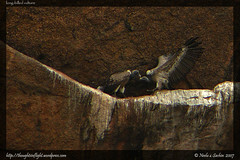 Having seen many posts of these Vultures at Ramanagaram, we decided to go there this morning. 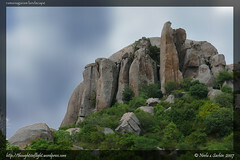 Many thanks to Ashwini Bhat for providing us detailed information about this place. We had only one agenda for this trip: to see the LBV. But even before we could start looking for them we sighted the Scaly Breasted Munia (our first sighting), a few Indian Robins, Ashy Prinias, WT Kingfishers, Laughing Dove and also an Egyptian Vulture (in flight). A look through the binoculars on a far-off rock yielded the sighting of a solitary Long Billed Vulture. We set base at the opposite rock and sat watching this lone bird. We saw it preening itself, spreading its wings, walking around the crevice; spent a good one hour with it. 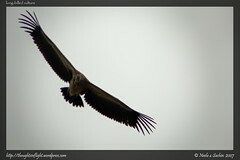 It was very far but we were thoroughly engrossed observing its behavior. We were considering ourselves fortunate to have sighted at least one when suddenly there was a spurt of activity. Three others landed, some took off again. 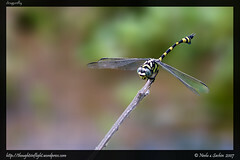 At one time, we could see three sitting on the rock and atleast five in flight, with one flying directly above us (and very close). It was an awesome sight. 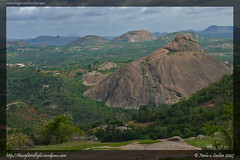 Having had our heart’s fill of sightings of the vultures, we headed towards the Ramadevara Betta. After climbing a few hundred steps, we reached the Rama temple. The area around the temple was productive for birding. 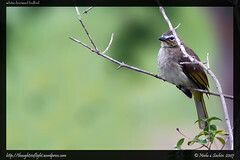 We had our first sighting of the endemic Yellow-Throated Bulbul. After the temple, the trail led us to the top of the hill. Towards the end were a few steep steps carved out in a huge rock (scary, but safe). At the top, was a plateau where there were not many birds. 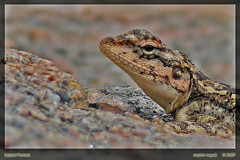 We did see some tree pipits, the rock agama, some lizard and amazing 360 degree views of the area. With the gentle cool breeze and the solitude of the place we had a very peaceful and soothening experience. 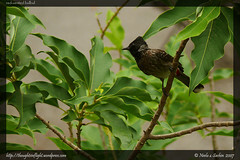 On the way back, we stopped by a few trees where many Bulbuls (Red Whiskered, Red Vented, Yellow Throated) could be seen and heard. Also, there were quite a few Sunbirds (Purple Rumped, Lotens), Flowerpeckers and Oriental White-eyes hopping from tree to tree. 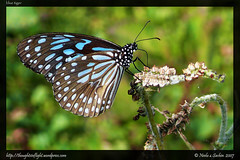 A lot of beautiful, multi-colored butterflies could be seen all along the way down. 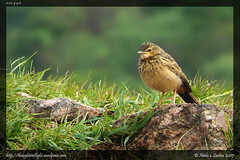 A hearty lunch at Kamat Lokaruchi topped up an extremely satisfying birding session. “Aamchi Mumbai” is where we both are from and where our hearts belong. Even though it is hot, crowded, polluted and not so clean nor green, it probably still is the best place in the world for us. We took a few days off this week and made a trip back home to Bombay. 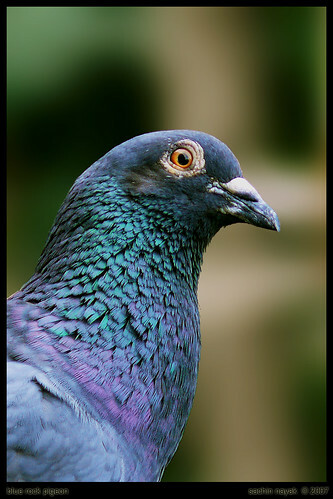 Before we got into bird-watching, we had never imagined that birds other than crows and pigeons existed in the concrete jungles of Bombay. Guess we couldnt have been more wrong. Bombay has a very active bird-watching club (google for Mumbai Bird Club) which organizes bird walks almost every week, and they do get some amazing sightings on each of their trips. Our formal attempts at birding turned out to be damp squibs. The visit to Sanjay Gandhi National Park in Borivili ended prematurely when we found the road to Kanheri (the recommended trail for birdwatching) was not motorable on our two wheeler. Subsequent attempts at alternate birding locations (hampered by lack of information) meant a truncated drive towards BNHS CEC (where a permit is needed) and a brief visit to Aarey Milk Colony (where we didnt know where to go). 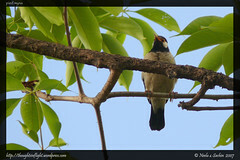 Nevertheless we stopped for 10-15 minutes for our first sighting of the Pied Starling/Myna. The highlight of the trip however was “Balcony Birding”. The number of birds we could see from our homes itself was a big surprise. 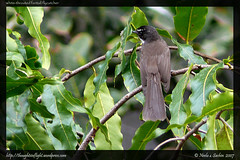 From our house in Goregaon, a bunch of around 3-4 white throated fantail flycatchers could be sighted everyday. 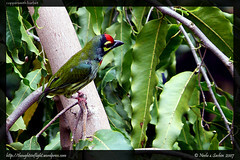 Other regular visitors were the Red Whiskered Bulbul, Red Vented Bulbul, Purple Rumped Sunbird, Oriental Magpie Robin, Common Tailor Bird, some white doves and the most suprising one… the Coppersmith Barbet !!! A lot of bird calls could also be heard (including the WT Kingfisher). And of course, there were hundreds of house sparrows; their incessant chirping could be heard throughout the day. 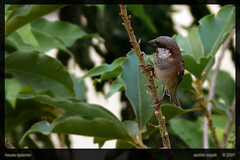 It was almost a relief to find them so abundant in Bombay while they are rarely seen in Bangalore. 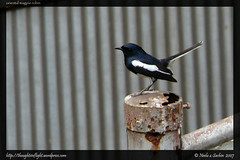 The trip was a good break from our routine humdrum and it felt great to be woken up at 6 in the morning with the shrill call of the fantail flycatcher rather than the usual doorbell of our maid or the maddening honking on Hosur road. …now though its back to the grind. Adarsh, Anush, Deepa, Nisarg and the two of us spent a lovely morning in the Manchinebele dam area today. Being summer time, our expectations (with respect to bird sightings) were not too high but suprisingly we had a rather productive session. 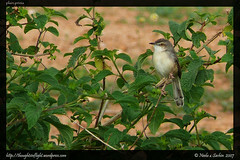 All along the way (after taking the turn from Mysore Road) we saw a number of birds. We would drive some distance, stop and see a few birds, attempt to photograph them and drive again, thus taking numerous halts during the 10km drive (which probably took us around 3 hours). On both sides of the road, nurseries and farms provided good birding opportunities. However the road for the most part was terrible and our car must have had an unhappy time (with a few bruises here-n-there). For the two of us, the highlights were our first sightings of the White-browed Bulbul (which in our initial enthusiasm, we mis-identified as some exotic babbler) and the Racket-tailed Drongo. Also got to see our favorite Hoopoe once again and the beautiful Indian roller, though we didnt get any decent photographs. 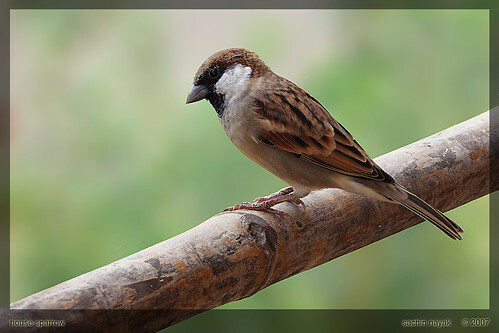 We saw number of house sparrows which have become uncommon in Bangalore and other places we have visited in recent times. The landscape near the dam backwaters was beautiful specially with Savandurga in the backdrop. The lake was surrounded by hills which had a lot of greenery. You could find a lone angler trying his luck at fishing. 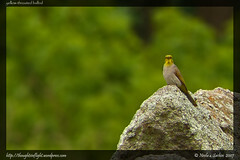 Even if one is not into bird-watching, the place must be visited for its scenic value. 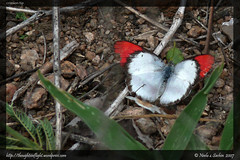 Along with the birds, we also saw the rock agama and some beautiful butterflies. There are two ways to get to Manchinbele Dam – one via Mysore Road and other via Magadi Road. We took the former. On the BLR-MYS highway, take the right turn immediately after the Rajaraseshwari Dental College (which is probably 1.5 kms after their Medical College). Follow the road beyond the Big Banyan Tree, straight leading to the Dam. However there are a few forks enroute. It is worthwhile stopping by occassionally and asking the villagers for directions.